Antiques experts Paul Laidlaw and Margie Cooper kick off the third leg of their road trip in Chippenham. Margie learns about the beginnings of modern photography. Browse content similar to Episode 8. Check below for episodes and series from the same categories and more! It's the nation's favourite antiques' experts. Welcome to Wiltshire, as our great western wanderers approach halfway. Is Wiltshire north of the Arctic Circle? and a vintage Alfa Romeo. And you end up looking like something a dog's brought in. And your mate's that weird bloke. Is he wearing a tartan shawl, looking like a fish wife? highly respected in their fields. Margie's a silver spotter of some renown. Whilst Paul's a militaria man. He certainly knows his Battle of Arras from his Elba. Fascinating stuff, these Victorian colonial wars. approaching trench warfare, with ground gained at a premium. You are kidding me! Oh, no! That's ludicrous. but at least he's thinking big. -It's only two days into it. Anything can happen, it turns on one lot. at St Buryan, and heads both north and east. before arriving at Newent in Gloucestershire. and ending up at a Cotswolds auction in Stroud. actually called Kington Minchin until the 13th century. -Oh, no! A campaign bed! Is that military in there? What's the market like for that? Does it sell at all well? Not only am I going, I'm taking the blanket. Leave me with the blanket. Margie, you and the blanket, have a good 'un. See you later. -Pleased to see you, Richard. -It's good to see you. This is your emporium? We will be able to do something here, I'm sure. Richard has got quite a mix in here. feel about a lot of it. Rationing, that sort of thing. How many posters have you got left of your civil defence posters? which also gave us Bristol cars. That sounds a tad encouraging. In the window, Richard has some trench art from The Great War. I actually found it, it's a dog tag. So it is, yeah, a wrist item. but there was this vogue for wrist identity discs. You'd get them in aluminium, salvaged from aircraft. This could be a slice of a brass shell case, in all honesty. What makes it more interesting, as well, it's got "1918" on it. He was fighting in Italy. A poignant thing, beautifully executed. at the border between Italy and Austria. British troops to cross pre-war boundaries into enemy territory. I like that. Have you got high hopes for it? Is his militaria reputation preceding him, I wonder? Luckily, he's got plenty of other strings to his bow. What's the story with the tapestry that you're using as a backdrop? It came in with a box of things and bits and bobs. -but it wouldn't be dear, would it? I think we can pull something out of the hat here. He's not giving much away, is he? Canny. Ready to bargain, though. This is me taking a liberty. I'll give you 20 quid for the military stuff and that tapestry. -OK. What can they be? We can do something here, I'm sure. £35 for all of it would be the best. You know what I'm going to say, don't you? 30 quid and we do it. -Easy as that. Cheers, Richard. -That was painless, wasn't it? Good man. That is worth taking a punt at. I'll tell you what, I'll give you some money. Paul seems to have acquired a bit of a spring in his step from that deal. Am I happy? Oh, yes. Essentially, two lots there for £30. £15 a lot. and Second World War civil defence posters. Great! But the tapestry, I think, is the better. I had to play down in the shop. The lining cloth's fabulous, let alone the tapestry. That could do me proud. without too much trouble at all. to Lacock, to visit the grand home of a great Victorian inventor. one of the fathers of photography. -I am. You must be Margie. -It's a nice old place. was inherited by William Fox Talbot in the 1820s. a student of everything from Egyptology to philology. When did all this idea with photography begin? It happened on his honeymoon. His wife, his sister was there, typical Victorian honeymoon. They are all doing sketching and drawing on the shores of Lake Como. -He found that he was a really rubbish artist. to try and figure out how to make science create images all by itself. That's when he got the first idea. by placing objects between sunshine and light-sensitive paper. would change the paper and give you an image. This is a replica camera. -It's just like the little Mousetrap Cameras that Fox Talbot had. -and a little wooden box. Close it back up, the lens is on. couple of hours, because the exposures were extraordinarily long. -for the image to make. This window is the most famous in photographic history. in August 1835. The negative is considered the oldest in existence. It is a bit of a boring window, really. Why did he choose that? It is, and a lot of people have commented on the fact that it was probably a boring shot. leave traces behind, as well. and you could count the panes of glass in the window. brings up the image and you end up with paper negatives like this one. -you could make as many prints as you wanted to. I would have been shouting from the rooftops, wouldn't you? -I would have, yes, but he didn't. when his somewhat pushy mother might have preferred the Talbotype. By 1835, he had created this process. -but he didn't. He didn't tell anybody. I think that he was waiting for later developments. -He was going to work on it more later. He had reached a plateau and was going to move on from there. and also try to perfect the process. and had a final product to show to the public. -But Daguerre really stole his thunder just a teeny bit. and at the time of his death, the daguerreotype was still the king. is the one we continued using all the way through the 20th century. a spot of sunshine always comes in handy. This is what it's all about, Margie. I'm shocked to say I'm quite enjoying this! from Lacock to Hungerford in Berkshire. and south-east England, the town is a transport hub. and Hungerford is very fond of antiques. As I'll ever be. It's big enough. -But is it big enough for both of us? -Margie, I think the door is round there. I sometimes wonder whether Paul could be a little more gentlemanly. Choice won't be an issue here. Huge is one way of describing the Hungerford Arcade. -Or you might opt for enormous. -Thank you! I'm glad you like it! -Good gracious me! And you are in charge? with customary pluck and determination. Paul adopting his usual clockwise crawl. It's a mirror! Praise the Lord! I thought this place went on forever. ..seems to have engaged the services of a personal shopper. I've seen a funny thing up here. I thought that was a bit of a laugh. -It IS a laugh. Is it '50s? -28. This is not my cup of tea. What do you think? Take a punt on that. I think it all depends on price, doesn't it? It certainly does. Stand by, Adrian. Francis, I've got a nice lady here looking at a boat. -How dirt cheap can you get it? And she really needs it ever so, ever so cheap. Actually, even GIVEN would be great! 15. Do it, do it, do it, do it! Yeah, OK. 15, if it's any good. Thank you. I'm nearly there. I'm nearly there. -You really worked it there, didn't you? How does he rate in Margie's Nice Dealers Guide, I wonder? -Adrian is 10 out of 10. 10 plus. Paul's military know-how must be paying off once again. What's the chances of me finding something everyone else has missed? Don't get excited, it's not the Holy Grail. However, look at this. Cracking little veneered paperweight. I thought it was a box. With this applied badge on the front. It says, "Wooden paperweight with monogram. £16.95." -Let's go and have a close look. -Ah. The long arm of the Laidlaw. We've got it. OK, so, it's all about this badge. Now, for my money, that's silver. And that badge, we have the Imperial Crown, an A with a central cross. This is the badge of the Green Howards. themselves from another regiment also commanded by a Colonel Howard. -So, they used uniform colours to tell them apart. So, what is this badge, exactly? Well, it was either a silver cap badge or collar badge, I suspect. to serve as a high-class paperweight on the desk of some officer or other. and I'll take that all day long. I think we'll hold on to that one, do you think? Sounds like, even at the asking price, it might pay off. Margie has heard the call of a more expensive item. -That's quite nice. White onyx. That's been there a while. That's a little bronze bird that's been painted, cold painted. enamelled on - simply painted on cold. although it's not terribly old. really good money, but it's got something about it. -It's nice and clean and it's...a charm. and it stands a chance of somebody else thinking it's charming. -It's 65, but there is a discount. -And you're going to have a word. -I will have a word. He's a very nice chap. Cor! Having seen Adrian in action, I'm sure he's as good as his word. Look at him! He's swaggering. Oh, no! We've got to beat him, knock that swagger away! Adrian, you're certainly entering into the spirit of this. -But what can he do this time? -Hello, Don. It's Adrian here. I'm ringing up about your cold-painted bronze. I know you've got some discounts on it. It's 65. Can you please give me your very best? You're saying 35? They're really looking at the £20 mark. -I don't think I've got it for 20 quid. -Ah! That's more like it. That's the end of it, is it? if I get a squeeze out of this, a little...I can get 20. -I'll have it for that. I'll do anything! I like it. I like the squeeze bit. -I'm a married woman, you know. I really shouldn't be squeezing anybody. -Are you sure he's going to be OK? -These two are quite a pair, aren't they? You can go and wrap that now. I'm finished with you now. Paul has found a couple of decanters moored alongside Margie's boat. This one, I'm afraid, has got a broken stopper. So that is worthless. Gone. Kaput. So why are you still looking at this? Well, the form is rather elegant. Good form, nicely cut. but absolutely right for it, this is a modern piece. We've got some etchings here, the arms of Vintners' Hall in London. We've got the date 1671-1971, so it's a tercentenary celebratory piece. and wine used to be landed. If you are a wine buff, I think that's pretty good. But look at the bottom. is the name Orrefors and a serial number. That would have been a gift, in my opinion, but it's not a pair. Now, if you said half of the 58, £30. Would I pay £30 for it? It's not an antique, but it's a good thing. Interesting. -just a few feet away. -That's a case for a carriage clock. The carriage clock was meant to be carried. Press button, hidden pressed button to release it. so you can look at the clock face. Why is there a hole there and a button? There was a button because the clock that went in there was a repeater. A repeating carriage clock is an expensive commodity. digital screens back in 1880 or whatever. You fumble over, press the button. "Ting, ting, ting." that adds a lot more value to the whole than the £23 asking price. -Hello there. How are you doing? -Hello, Paul. I'm fine, thank you. -Time to enlist his own helper. Meet Rita. -What kind of things do you like? -You won't get any in there. -I know. I can guess as much. Rita sounds like another excellent guide. What's her telephone manner like? with the monogram on, and asked if you could do it for £10? -Thank you very much, Avril. -How are you doing? Any joy? I've spoken to the dealer about the paperweight. -Her very best on that is £12.50. -you can have both of those for 30. You're tempting me now, Rita. I think Paul is quite pleased with those prices. Now, where has Margie got to? who looks as though he might be making another purchase. I'll take the paperweight, decanter and that. -And I'm delighted to give you money. I owe you £32. Is that right? £42. £42. Every penny, Paul. You've not spent many today after all. -Come on, time to go home. -Please, Mum, can I stay a bit longer? -I want to play some more. She's awfully strict, isn't she? Sweet dreams. Next day they've got Margie's bottom-line firmly in mind. Apart from the obvious, the Holy Grail for a pound. on the shop owner's sandwiches, I'd buy them. Yesterday Margie hardly got started, managing just a white onyx ashtray. I've finished with you now! which means she has plenty to buy and £125 to spend today. an identity bracelet and some posters all included in his haul. To put the hood up. Cosy in here now. I'm happy now. Well, if you're happy, Margie, WE'RE happy. at Stroud. But our next stop is back in Wiltshire, at Semley. and you can see it stretching to the south. around here, or that Margie's shop once had quite a different usage. -Hi. We have coffee for you. -You realise how cold it is in that car. because we don't have until the cows come home, you know. All right. Just getting the geography. potentially a lot of dealers to call. That's a nice little thing, isn't it? £60. Each! I thought they were a pair. Oh, life's full of disappointments. Although there's always time for Frankie Vaughan impressions. Hm. Needs some work, I'd say. Now, that looks the part. They're rather nice, these Scottish brooches. Not very old, it's 1980s. Edinburgh silver. But they do sell them, they're very attractive. It's £39. Quite nice. I wonder if she's got anything else. Margie's picked up the scent here. That's a bit older. That's 1920s. Yeah, Glasgow. Celtic one. That's £30. Trix is poised to call the dealer, when a third one turns up. They're coming down in price. And this is down to £20. And it's Glasgow hallmarked again. I'd love to have what they call a parcel in this trade. I'll bet you would, Margie. so let's hope Trix can do her magic. -for some prices on some jewellery, please? I'm drained at the end of this programme. With Margie on edge and the phones on the blink, it's all down to Trix. -The trade price would be 80. But as it's you.... I think we could go to 50. -Oh, that's very kind of you. Yes, thank you so much. Those are lovely. and Margie's decided to auction each one as a separate lot. Not that she's finished in here just yet. It's for hunting or drinking. I've never seen them with the shaped bottles before. Well, that's perfectly clear(!) No? OK, what we do know is the ticket price is £44. That's too much for me to make a profit. -Would 15 quid buy it? -I don't know, but I can find out. -Can you? Is it a ring job? -It is a telephone job. -OK, thank you very much indeed. Crikey, Margie. You're bargain crazed today. Hi, Susan, it's Trix at Dairy House. Your little travelling case with the three bottles? Wondered if you could possibly do it for 15? OK, she said the very, very best could be 20. What I was thinking was 18. She said could you possibly go to 18? I'm sure she'll be very grateful. All right, thank you. Beginning to feel like Attila the Hun here. Yeah, and he's not noted for his love of antiques and collectibles. But we know what she means, eh? I'm just going to settle up now. Would Attila ever have said that? Got my brooches. Got my little leather case. I'm off. Now, while Margie's been busy buying brooches, what's Paul been up to? and a medieval castle beside the River Frome. was built in the late-14th century by a Sir Thomas Hungerford. you can still detect the outline of the original quadrangular design. It had a tower on each corner, so four high towers. You can see by the one in front of us, the Lady Tower. Everything was self-contained inside. There's a Great Hall. and a little courtyard in the middle. This must have been chosen because it's defensible. there are higher hills all around. It was a status symbol. It's a des res, is it? -It is indeed, you know, "Look at me..."
"..I've got all this money, here's my castle." without permission, which basically he got away with. He was fined a pittance, as far as we know. -the little steppy bit that we associate with castles. -..but was naughty and didn't ask. with the powerful John of Gaunt. He was also the first recorded Speaker of the House of Commons. set about expanding Farleigh Castle. with a curtain wall and a moat. so that this one was solely for the use of the Hungerfords. than any of Sir Thomas' towers. Oh, my word. This is lovely, isn't it? I am an anorak of armour. That's what I study in the dark hours. -Yes, it's wonderful, isn't it? It was almost certainly commissioned by Sir Walter. there's a very faint image, which is called the Kneeling Knight. There's a very faint trace of the Hungerford Arms. -And we think it's probably Sir Walter. St George was the patron saint of the Order of the Garter. Lord Walter was admitted to the Order of the Garter. -That's high status, isn't it? Those are the knights closest to the King. Yes, absolutely, and a real honour. of favour but also spent and gambled away the entire family fortune. with the walls used as salvage for other great houses. can be found in the crypt. Are there remains inside these coffins? There are. There are probably only bones now. and then the lead encased in wood. Is this a common practice? I've not seen anything like this before. but this is the best collection that there is in the country. so the last Hungerford who wasted all the money. -This one here is very lifelike. I always say good morning and good evening to them. -That's... It's respect, isn't it? -It's their castle, after all. -Think we should say goodbye. -I think we should. Good night, ancestors. a decanter and a Green Howards paperweight. I think Margie could be looking at a clean sweep of profits. The Swedish decanter, that won't do brilliantly. The little ashtray. Keyword there - "ashtray." They are unloved objects. I really envy him his carriage clock case. It's me again, isn't it? this leg of our trip concludes at an auction in the Cotswolds at Stroud. I think we've got a good day ahead. the company could be better! of Laurie Lee's Cider With Rosie. is the undeniably military flavour of today's sale. So what does auctioneer Nick Bowkett think of what our two have to offer? I think you'd almost certainly want to own it. and we have had interest from Scotland. but a lot will hang on the paperweight. Well, I wonder what they'll make of those views in the pews. otherwise you're going to have a really grumpy partner. First under the hammer is Margie's ashtray. You can't go wrong with that, can you? £40 I'm bid, straight in. Things are looking distinctly chirpy already. How many Green Howard collectors are online, I wonder? It's going to make 20-25 on a bad day. On a good day, 45 quid? 50 bid, straight in at 50. On the phone at 55. 60. 5? -You've got a telephone bid. 110? 110 on the phone. 130 on the phone. 130. All credit to you, mate. Well said, through gritted teeth. Would it help if you just punched me square in the face right now? Do you want to? I'll take these off, it's all right. I can take it, I'm a big boy. I'm trying to be a good sport. It's difficult. But I think they're missing it. Oi! Pay attention, you lot. Someone open the bidding up for me, £20. on the net straightaway. 22. Come on, you two, pay attention! £30, any advance on 30... 32. Another nice profit, completely missed by our experts! possibly for a dressing table, we now think. £32, takes both my commission bids out. 40. Room's quiet, it's on the net at 42 now. -Ooh! That's doing better than it should. On the net at £45. Yes, someone out there really wanted them. Good stuff. plus the Italian front trench art. I can open the bidding up at £30, 30 bid. 32, net bid. 35, 35. 70 I'm bid. I'm selling at £70. Er, answers on a postcard, please. I'm going to go home and buy a big book on militaria. And hit me with it! Now, can Paul decant some more profit with this? 14, 16, 18, room bid. 22? 30, £30, 30 it is, now. -Decanters don't sell very well. Thanks for that. Where were you when I was buying it? 38 and selling at £38. Certainly nothing to sniff at there. Paul's got his nose in front. -I bought these with you in mind, Mr Laidlaw. Time for Margie's big brooch sale. She's especially PINNING her hopes on this one. and the bidding up at £40. Lot of interest, straight in at 40, straight in at 40! 48, I'm bid. 50, 5, 55. It's about what it's worth now. It's on the books, 75. 80 anywhere? -I've never seen Margie look so euphoric. I can't believe it's worth that. Now, brooch number two. Can she do it again? Look at this, here we go. Room's quiet, 30 it is. £30. Do you not think he's labouring this? Not think he could go a bit quicker? 42 now? 42, 45, 48? No? No? Up to 50 now on the net. It wasn't long ago this was a good auction. I'm hating it now. I'm selling on the net at £70. -It's a mad, mad world of antiques, isn't it? -Better when it's mad going my way. How much will her third brooch bring? Start the bidding at £20. 20, I'm bid. Thank you, 20 it is. 28, 30. 30, I'm bid, now. 35, 38 takes the book out. New bidder on the net, £40. It's going away on the net at £40. 42, someone else came in. Well done, Margie. Quite a result there, girl. and turned it into £250! Margie's about to win this auction. Only Paul's highly fancied carriage clock case can stop her. -There you go - drunk dealers on the net. 30. 32, 32 I'm bid. -Come on, I need it badly. £50, it's on the net and selling. Did that come in after? It did! It did! Take it! 55, 55 - it came in before I dropped the hammer. £60. Selling, then, at £60. -That was money in the bank from the minute you bought it. but that late drama means Paul's just pipped her to the post. A rough patch in the middle for me. I came over all uncomfortable, for some reason. leaving her with £333.78 to spend next time. so he now has £451.64 and a substantial lead. we had someone idea what we were talking about, Margie! -Yeah, but one thing moving forward? If I see a brooch, it's over between us! ..versus Paul Laidlaw and the Basement Of Doom. The last guy was here a very long time. 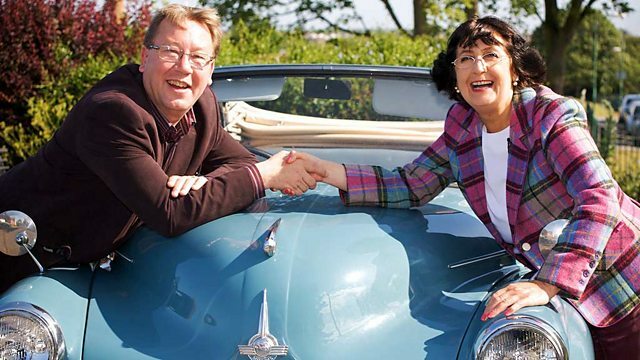 Antiques experts Paul Laidlaw and Margie Cooper kick off the third leg of their road trip in Chippenham. Margie learns about the beginnings of modern photography, and Paul discovers the fascinating history of Farleigh Hungerford Castle.